Beautiful Gated Community on a Semi Private Beach! Unwind and relax at this spacious condo located on beautiful Cowpet Bay on the East End of St. Thomas. This peaceful and relaxing condominium has unobstructed views of the ocean and outlying Islands. It sleeps up to 4 people very comfortably, 1 king bed and 2 single beds ( You can convert 2 single beds into 1 king bed ), 2 full bathrooms, gourmet kitchen with new high end appliances, BBQ, flat screen TV in the living room, telephone, FREE internet access and more. Stroll 1 minute from your front door to enjoy the stunning white sand semi private Cowpet Bay beach. Property Amenities: access to beach and beach chairs as well as pool with grotto, waterfall, hot tub and pool bar. The beach shack rents kayaks, sailboards, sailboats, paddle boats and snorkeling gear. Gym and spa ( fee ). One restaurant on the property, Caribbean Fish Market. Within a five minute drive to Red Hook where you have numerous additional places to dine and shop as well as the ferry to nearby Islands. 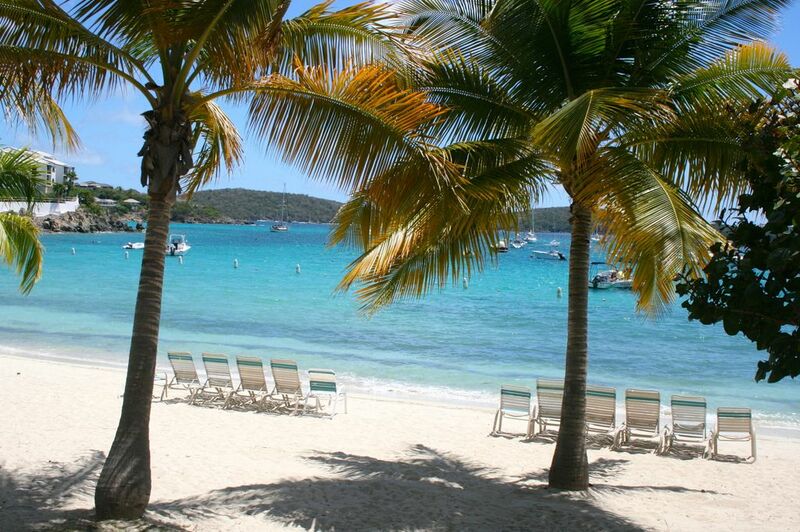 Cowpet Bay West is one of the safest and nicest gated community on St. Thomas. Big table with 4 chairs, looking over the ocean. Cockroachs in the kitchen. On the counter tops and every time I opened a drawer. The coffee pot leaked water all over the counter top. The bed in the master bedroom was very hard and made a terrible noise like it was going to collapse when you got in . The description of the condo says Pool Bar, Kyak/snorkel rental and 2 restaurants on site. The pool bar was boarded up, the rental place was boarded up and one of the 2 restaurants on site is closed permanently. The 1 restaurant that was on site was not family friendly as the prices were so sky high there is no way we could afford to feed our family there for dinner. I realize the island is still in recovery mode. The description of this place is misleading. When you pay thousands to stay at a place you should be able to trust that the description is accurate. Disappointed. Fantastic view with everything you need! This place was so comfortable for the 3 of us. Plenty of room for 2 adults and our almost 21 year old daughter. The deck is amazing to hang out on in the mornings with coffee and beautiful at night as well. I can't begin to say how much we enjoyed the view. It was great! We felt very much at home here. We traveled a lot every day around the island and over to St. John and this was a perfect base for us. We cooked in the unit at least once daily. It has everything you need...even a "junk" drawer! It had all the stuff you might not even realize is nice to have. Rulers, tape, scissors, sewing kit, all the stuff you might need. There were games, books and cards too. The pool was great to relax in and the beach out front was nice as well. Spent several hours at both. If you want to be comfortable with a lot of amenities in the unit with a spectacular view close to a ton of things to do with a beach out front....come here. The property always felt very secure as well with the gates and guards. Well equipped and stylish condo with a beautiful setting and view. Fantastic restaurant on site but also close to Red Hook and other great beaches and restaurants. Peaceful morning and night with a feeling of safety and beauty. Makes for a wonderful getaway. Thank you for your comments Craig. It was great chatting back and forth with you prior to your arrival. I am glad you had a great time. Hope to see you back sometime soon! This property was perfect for us. It was cozy and had everything you needed for a week at the beach. We spent hours sitting on the large balcony which had the most gorgeous view. It is in a great location - close to RedHook for restaurants, groceries and access to the ferry. The restaurant on site was very nice and there are others close by. The beach on the property was large so that you didn't feel on top of others. Although we never used the pool it looked beautiful. We would definitely stay here again. I am glad you had such an enjoyable stay Priscilla. We hope to see you and your family back next year! Really enjoyed our stay at Cowpet and at this specific unit! The unit is just wonderful, great views, spacious, very nice kitchen, great location, and great condition overall. It was so nice to be back at Cowpet after having lived there when I was growing up. The beach is still quiet, clean, and beautiful and having access to the nice pool and hot tub at Elysian is a big bonus. Thanks to Brittany and Lorice for making this a worry-free enjoyable stay. Amazing location and perfect place for our family! The is the second time we've stayed at one of the condos at Cowpet Bay West and we absolutely love it. We just got back from vacation on Monday and stayed at this condo for a week. The condo is super spacious and has a view to die for. Everything is provided for you including any kitchen items you would need plus a ton of extra towels/beach towels, sheets, beach toys and coolers for the beach. The condo was clean and well taken care of. In Cowpet Bay West there are 2 buildings of condos, this one is on the upper level building which means it has killer views but is a bit farther to walk to the beach. Our first visit we stayed in the lower building which was a little closer to the beach but didn't have as nice of views. But this condo isn't far from the beach at all though! I think it took us about 3 minutes to walk to the sand from our front door. There are a lot of steps down to the beach because the condo sits up higher on the hill, but our 6 and 4 year old boys managed them perfectly fine! The beach itself is always super quiet and the water is fairly calm and shallow. The sand is always clean and chairs are taken care of. The pool is also right there by the beach so it's super easy to go from one to the other without walking a far distance. Having the Caribbean Fish Market restaurant right next store is also extremely convenient and has great food. Sangria's, the other restaurant on the property wasn't back open yet when we went this second time as it was still needing repairs after the hurricane. The other great thing about this location is it's proximity to Red Hook which is less than 5 minutes away by car and has a bunch of fun restaurants and shops. It's also where you catch the ferry to St. Johns which is a must-do for a day trip! We had a few questions when we were there and the property manager was very attentive and got back to me right away with info and answers. Thanks so much opening up your home and providing us with such a great place to stay on St. Thomas. This was only our second time, but definitely won't be our last! We will certainly stay at this condo again next time we come to enjoy the warm Caribbean sun and sand! Thank you so much for the review. We are glad you and your family had a great visit and hope you will return next year! Cowpet Bay West , as you mentioned, is in close proximity to a lot of activities (whether it be the beach or Red Hook) so it really is a convenient location for guests. St. Thomas is a special place and it seems like you got to enjoy all that it offers. The condo has unobstructed views of the ocean and outlying Islands. It is located seconds from the pool and Jacuzzi, two great restaurants, CARIBBEAN FISH MARKET and SANGRIAS, a gourmet and burger pizza joint respectively, and within a five minutes drive to Red Hook where you have a dozen additional places to dine, shopping and the ferry to the other Islands. Ritz Carlton Hotel is a short 5 minute walk from the property. - 10% tax is INCLUDED - NO utility charge - NO additional charges - Exclusive Homeaway & VRVO online payment service fee - Cancellation policy: Bookings canceled at least 60 days before the start of the stay will receive a 100% refund. Bookings canceled at least 30 days before the start of the stay will receive a 50% refund.